The violinist, Vaclav Snitil, a former member of the Vlach Quartet and a frequent soloist with Czech orchestras, has died at 87.
newsagency report: Prague, July 20 (CTK) – Czech violinist and university teacher Vaclav Snitil died after a short illness at the age of 87 years in Prague on July 19, his son, conductor Jan Snitil, told CTK yesterday. Vaclav Snitil was one of the best Czech violinists of the 20th century. He was a direct follower of Otakar Sevcik and Jaroslav Kocian. Snitil’s students at Prague’s Academy of Performing Arts (AMU) were many excellent violinists, such as Vaclav Hudecek, Bohuslav Matousek, Jaroslav Sveceny and Pavel Sporcl. Snitil also chaired the jury of the Kocian violin contest in Usti nad Orlici, east Bohemia, for years. 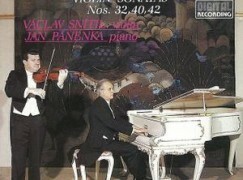 Snitil was an active performer of classical music for over 55 years. He played with respected ensembles, including the Vlach Quartet, the Smetana Trio and the Czech Nonet, and as a soloist accompanied by the leading Czech and foreign orchestras. He was a great interpreter of baroque music by Bach, Haendel, Telemann and Vivaldi as well as violin concertos by contemporary composers. Some of their works were written directly for him and dedicated to him. The funeral of Vaclav Snitil will be held in the centre of the Czechoslovak Hussite Church in Prague 4 on Tuesday, July 28, Jan Snitil said.